The Norman Lindsay Artful Cats Folio was released in 2001 as an edition of 2000 only, some images are available only as individual peices as all the folio sets have all sold out there are limited images available, plus postage. Every cat owner knows that although some cats might look similar, no two cats are exactly the same. They are all individuals with distinctly different personalities. 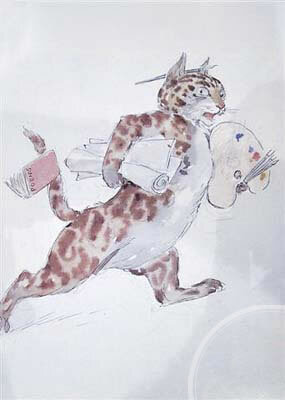 Famous Australian artist Norman Lindsay was also a cat owner and a cat person. He loved cats and for many years had a large brood of cats at his home at Springwood in the Blue Mountains of New South Wales – Norman’s daughter Jane tallied as many as thirty-five at one time! Thus he had the opportunity to study cats and their personalities over a long period of time. In his spare time Norman delighted in drawing his cats in various positions – posing, dozing, playing with feathers, defending themselves against fowls, dogs and children or simply curled into soft, cuddly balls of fur. Norman’s studies of cats during his long life convinced him that cats embody many human qualities. He expanded on this theme, endowing his cats with human characteristics, and among his many whimsical drawings are the nine watercolours reproduced in this folio. The original watercolours are all in the collection of the Mitchell Library, State Library of New South Wales. The nine unique watercolours produced in this folio cover a range of cat personalities and we are sure many people will recognise these traits in their own loved cats.